The Pranhita begins at the confluence of 2 extensive rivers - the Wardha (catchment area: 46,237 km2) and the Wainganga (catchment area:49,677 km2).This junction lies on the border between the states of Maharashtra and Telangana near Kouthala(near Sirpur kagaznagar). Right at the onset, the river enjoys a wide river bed. The river follows a short course of 113 km strictly adhering to the boundary between Gadchiroli district in Maharashtra and Adilabad district in Telangana.The direction of flow is southward unlike most rivers of the Deccan Plateau. Along its course the river is flanked by thick forests and harbors a rich biodiversity of flora and fauna. After completing its short journey the river empties itself into the Godavari River at Kaleswaram. 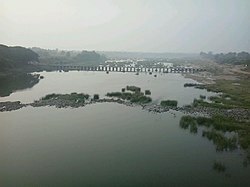 The river does not have any dams built on it so far.But a water project to construct a barrage is currently underway.This project envisioned at an estimated cost of Rs.38,500 crore is known as the Pranahita Chevella lift irrigation scheme and a joint project between the Maharashtra and Telangana. The River is used for water transport between Sironcha(MH) and Kaleswaram(TS). It is also a part of the 12 rivers in the Pushkaram list which is a festival in Hindu traditions. ^ "Villagers near Pranahita project the least informed". Thehindu.com. Retrieved 20 August 2017. ^ "District Gadchiroli - Rivers & Dams". Gadchiroli.gov.in. Retrieved 20 August 2017. ^ "Integrated Hydrological Databook (Non-Classified River Basins)" (PDF). Central Water Commission. March 2012. Retrieved 2015-10-12. ^ "Submergence, irrigation issues continue to dog Pranahita project". Thehindu.com. Retrieved 20 August 2017. This page was last edited on 27 November 2018, at 00:21 (UTC).